Since I’m having surgery tomorrow (prayers please!) I wanted to go ahead and post on Kelly’s Korner’s Show Us Your Life topic and I’m hoping I will be able to link-up tomorrow. Maybe some nice reader can link up this post for me? 😉 I don’t write blog posts typically in order to participate in link-ups but I loved the topic this week! We LOVE to read at our house! 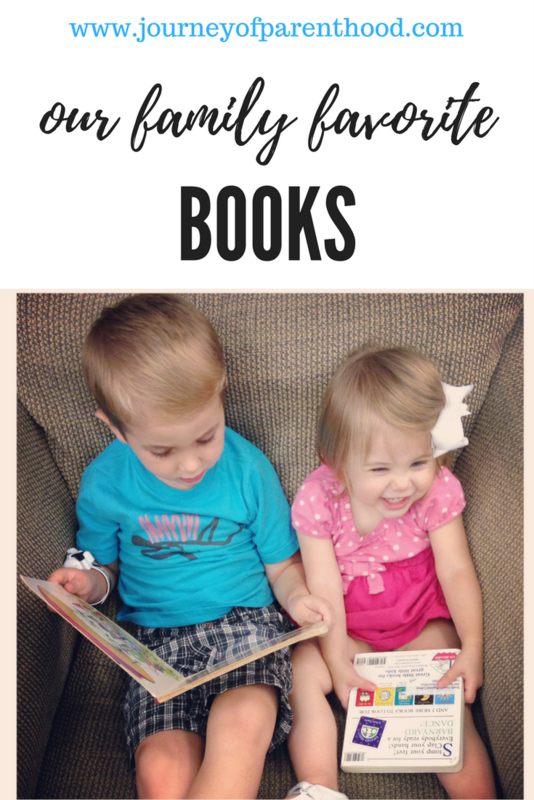 Did you know it’s important for you child to spend at least 20 min a day reading? 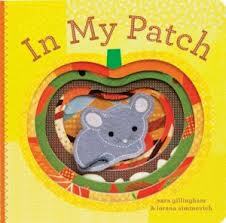 We read a story for each child before naps as well as a story for each child before bedtime. Now that Britt is getting a little older we will probably be able to just read one story together for them but for now I like that she can “read” touch and feel and more “age appropriate” stories! 2. 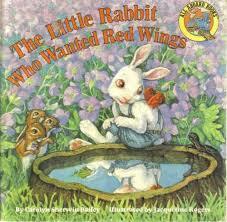 The Little Rabbit Who Wanted Red Wings: This was MY favorite book growing up. The copy we have is so worn that some of the pages are actually completely unattached! I need to just break down and buy a new copy. It’s funny how quickly childhood memories come back because I even remember my favorite parts and pictures! It’s a good lesson about being happy with who we are and I try to incorporate God into it when we read it by talking about how God made us special! 3. 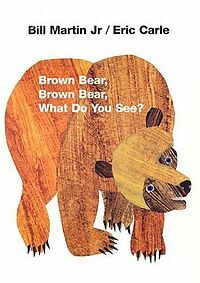 The Little Mouse, The Red Ripe Strawberry and The Big Hungry Bear: This is my favorite book to read to my kids. 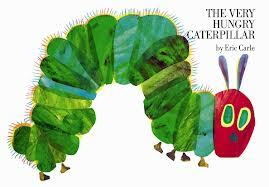 I can remember exactly the way my mom read it to me growing up so I do all the same thing she did. We “sniff sniff sniff” together to find the strawberry. I make my voice loud whenever I say “The BIG HUNGRY BEAR!” and I make my voice tiny for the parts that say “The Little Mouse.” It’s a fun book to read with adorable pictures. Kye always laughs at the part where the strawberry is wearing glasses (“Silly Strawberry! 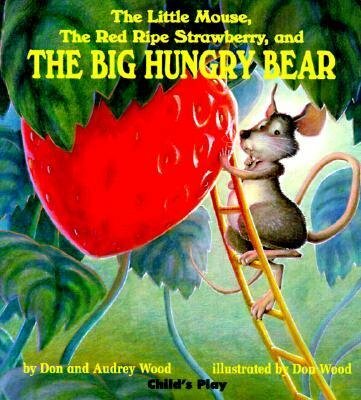 Strawberries don’t wear glasses!”) and we always talk about the mouses full tummy at the end of the book. 4. 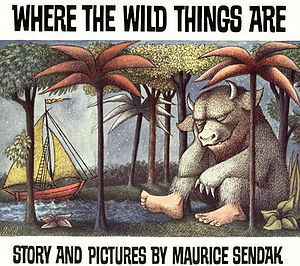 Where the Wild Things Are: This was not one of my favorites growing up. It’s not a very good “girl” book and can be rather scary. However, now that Kye is older it’s one of his favs. And it’s another fun one to read! We always act out the roaring of the terrible roars, gnashing of the terrible teeth, rolling of the terrible eyes, and showing of the terrible claws. The only downside to this book are the few pages where there are NO WORDS. We have to just make up words for those pages b/c Kye doesn’t understand that there can be pages in a book without a story to tell! 5. 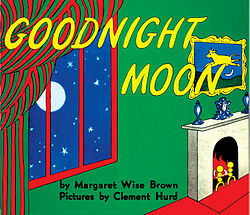 Goodnight Moon: I don’t actually remember reading this as a child either, but I have truly enjoyed reading it with my kids. Our favorite part is the bowl full of mush. What the heck is mush? Kye also always talks about the page where the little rabbit is getting into bed because the way the illustration is done it actually looks like he’s climbing out of the bed so Kye feels the need to say that the bunny is making bad choices b/c he’s not supposed to get out of his bed. 2. 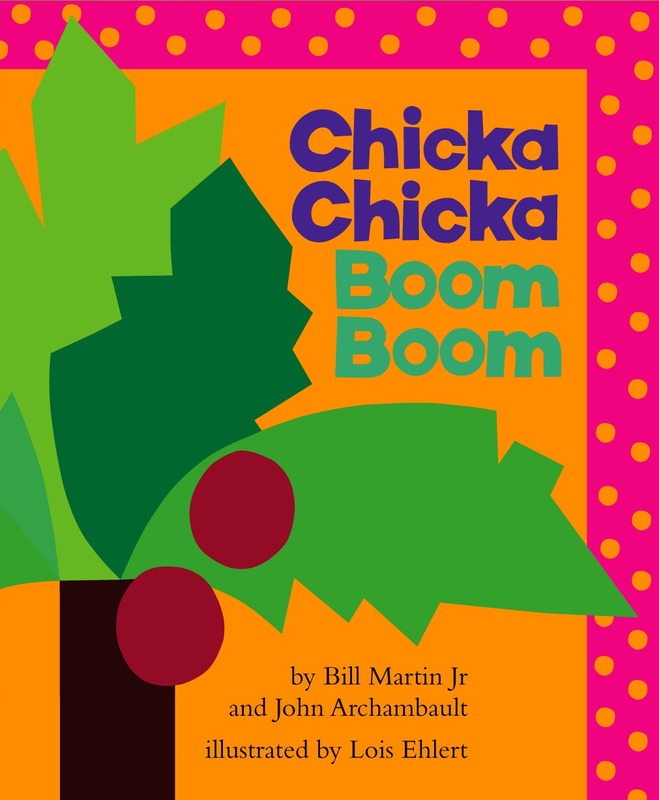 Chicka Chicka Boom Boom: I LOVE reading this book! The rhyming is so sing-song and it makes it fun 🙂 It’s a very high-energy book and can keep a little one’s attention so well. Plus, hello! It’s educational 🙂 We always sing the alphabet song at the end of the book where it shows all the letters and I point to each letter as we sing the song. 1. 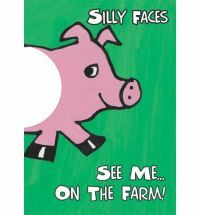 Silly Faces on the Farm: Britt is now a toddler but still doesn’t have a super long attention span so we keep her books short. Lots of touch and feel and simple story lines. 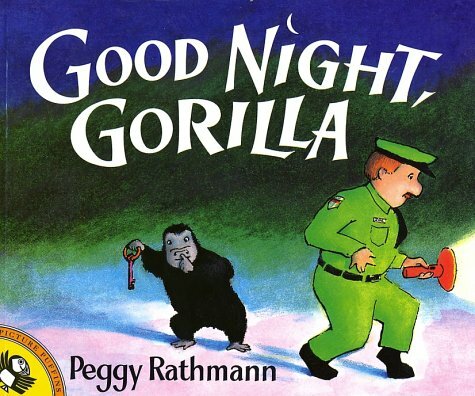 This book is one we ALL enjoy! It has cut outs to put our faces in so WE are the animals in the story! I found it on Amazon for only a penny! They make others in the series as well and I plan to add to our collection. It’s a great way to learn animal names and sounds in a fun environment! 1. 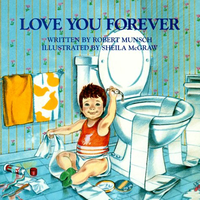 Love You Forever: This is such a wonderful book and one that makes me cry as I read it. I KNOW I’m not the only one who feels that way 🙂 I have read it to Kye since he was little. Mrs. Charlotte read it to all of her kids and actually does sing the “love you forever” lines which I’ve never heard anyone do before. I do NOT like how the child makes so many bad choices and we often talk about the things the child is doing that he shouldn’t be, but I love the message behind it. Kye has actually held me in his arms when I’ve gone to tuck him in and has “rocked” me and sang it to me, so sweet. 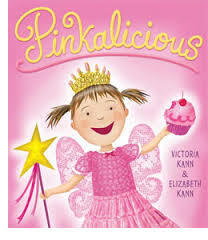 I wish they made a version with a little girl in the book so it could be more relatable to Brittlynn too! I have yet to find a good sentimental girl story??? Any suggestions? 2. Let Me Hold You Longer: This was a baby shower gift while I was pregnant with Kye. It is by Karen Kingsbury who is a popular Christian author. The book is based of her own relationship with her children and if it doesn’t make you BAWL then nothing will! I can barely make it through so I don’t read it often. I love it so much that I’ve actually thought about typing the whole thing into a blog post to share with others. We rush rush rush through life that we often miss our children’s “lasts” and often the lasts are more meaningful than the firsts! Again, it’s a boy main character! I really do need a little girl and mommy story 🙂 If you don’t go out and get ANY of the other books I’ve mentioned, at least get this one. It makes a WONDERFUL Mother’s Day present as well! 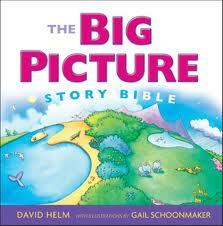 The Big Picture Story Bible: I am NOT as good at doing Bible time as I’d like to be. We typically will read from the Bible together during breakfast or lunch when it’s just the three of us. We’ve tried doing Bible time as a family in the evenings but every evening is just SO crazy that it doesn’t always work out. 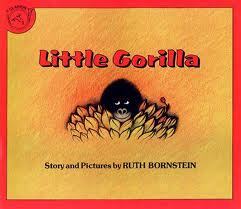 Kye and I have read through a couple different children’s bibles and are currently reading this one. While it’s not as detailed as some others, I LOVE the illustrations and how is hits the highlights in a way that engages the kids. Even Britt stays interested! It asks a LOT of questions that lead us to have some wonderful discussions together! I wouldn’t recommend it as the ONLY Bible resource for my children, but it’s a great addition to our growing Bible collection! Thanks again for praying for me tomorrow and especially for what will be a long healing process! Previous Post Britt is 15 Months Old! We read a ton in our house, too. My bachelor's degree is in Elementary Education, so I bought TONS of books in college that we are making great use of now. Several of our favorites are on your list, but there are also a few that we have never read. Can't wait to track them down at the library and try them out! A good mother/daughter book that we read is called "Over and Over" By Charlotte Zolotow. You can find it on Amazon. Britt might be a little young for it now, but my daughter is almost 2.5 years old and LOVES it. I am excited to try the others on your list I have not read yet. The Karen Kingsbury looks really good. I am sure I will be crying the whole way through. Thanks for sharing!